Young with his book in an image from the pH Miracle Retreat's Facebook page. 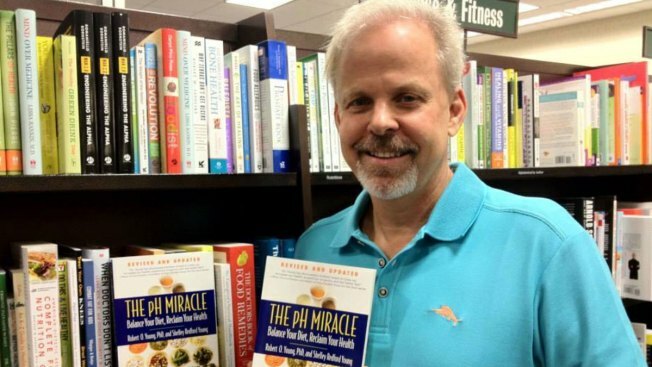 A San Diego man who penned a book claiming to treat low energy, poor digestion, aches and pains and disease pleaded guilty to two charges of practicing medicine without a license. “The pH Miracle” author Robert O. Young was arrested by U.S. Marshals in 2014, accused of practicing medicine without a license on his Valley Center avocado ranch. "The pH Miracle", sold through Barnes and Noble, Amazon and other stores, claims to help readers treat low energy, poor digestion, aches and pains and disease with an alkaline diet. Young's "pH Miracle Retreat" offers nightly rates from $1295 to $2495 per night. The rate includes lodging, meals, supplements, and therapies. According to the San Diego County District Attorney’s Office, Young and others at the ranch used intravenous treatments on patients. As part of entering his guilty plea, Young had to state that he has no post high school educational degrees from any accredited schools. He also stated he was none of the following: a microbiologist, a medical doctor, a hematologist, a naturopathic doctor or a trained scientist. Sentencing is scheduled for May 1.